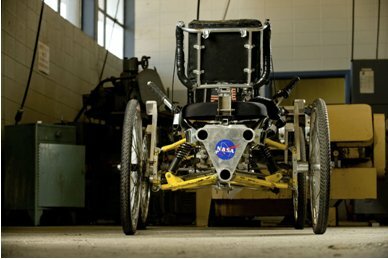 As we roll toward the 18th annual NASA Great Moonbuggy Race, set for April 1-2 in Huntsville, Ala., we know many of our race fans out there may have questions about the mechanics of the vehicles — the inner workings of the buggies themselves. The typical moonbuggy is designed by each team to take on the challenging GMBR course, which simulates some of the conditions the original lunar roving vehicles faced on the moon 40 years ago. And those buggies take a pounding. The course is unforgiving, littered with gravel and rock outcroppings, pits, sand traps, and simulated “lava rilles” much like those the original lunar explorers bounced and thumped across during the Apollo 15, Apollo 16 and Apollo 17 missions. So what does it take to conquer the Great Moonbuggy Race course? Over the next couple weeks, we’ll take a closer look at the moonbuggy itself… and learn more about these amazing machines, and what it takes to win. Let’s start with the core of the vehicle: the chassis, the framework or skeleton that supports the whole rolling structure. It is typically composed of a metal frame — usually steel or a combination of steel and other metals — supported on springs or some other type of suspension system, all of which holds the body of the vehicle and its occupants as they travel. Your win or loss in the NASA Great Moonbuggy Race can be decided right here, says Dennis Gallagher, a supervisor and space physicist in the Marshall Center’s Science & Exploration Research Office. Gallagher, who helps plan the race each year and shepherds teams from the staging grounds (the sprawling parking lots in front of the U.S. Space & Rocket Center) to the starting line on race days, has watched hundreds of buggies approach the course. More often than not he can tell from a walkaround and a shrewd visual assessment how the day is going to go for its drivers. “How strong are those struts? How good is that weld?” he asks. “Loose chains? Bicycle tires?” He shakes his head and smiles wryly. He’s seen it all before, and he’s rarely surprised. Teams often look at a combination of steel and aluminum, using tube-shaped metal struts to fashion a conventional rectangular frame for four-wheeled vehicles or a more creative configuration for three-wheelers (Gallagher doesn’t like three-wheelers; we’ll hear more about that in future installments). Of course, if your team has a sugar daddy (i.e., a reeeeeally good school or corporate sponsor!) you might always consider using composite materials to fashion your chassis. 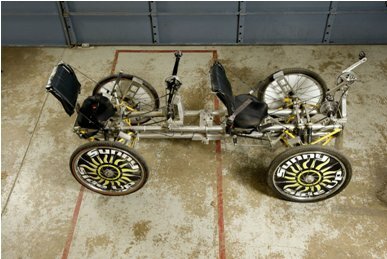 Gallagher recalls a university moonbuggy a few years back entirely fabricated with composites — woven or wound material embedded with a hardened epoxy resin fill for high strength. That buggy earned the Best Design Award; it didn’t win the race. Because the frame alone does not make the machine. You’ve gotta wisely choose your suspension options — and again, it’s all about what buggies are going to face on the field. We’ll talk about suspension systems and the buggy’s critical assembly/disassembly system — a key requirement that will help you sail through or leave you spitting rock dust — next time.